This page is dedicated to My Angel "Logan"
His life was cut short after 128 days. He was 4 months, 5 days, and 12 minutes old when the flu took him away from me. This page was then created for him, from me, and shared to you from his loving family. My name is Courtney Godfrey. 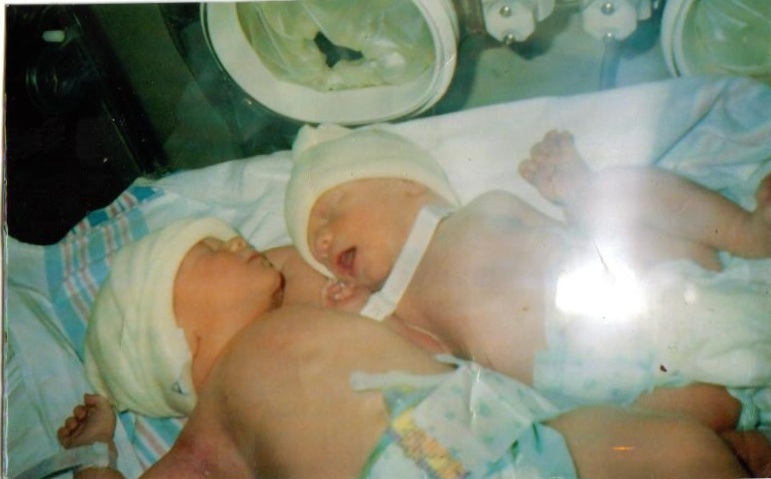 On September 7, 2004, at Fletcher Allen Hospital in Burlington, Vermont, I gave birth to twin sons, Camryn Shayne and Logan Ryan. They were both healthy. Camryn was 6 pounds and 4 ounces and Logan was 4 pounds and 12 ounces. I carried them to 38 weeks (which is somewhat uncommon for twins), but both of the boys were born with very mature lungs. Everything was going good until the boys went to their 2 month check-up. Logan had been getting sick and came down wiht a fever, so the doctor decided to hold off on vaccinations for both of the boys so they could be on the same schedule. We made an appointment for 2 weeks later. At that appoinment Logan was feeling a little better so the both got their shots. From then on Logan never seemed to get better for more than 3 days at a time. Logan was my coliky baby. At birth, he had a very wide mouth. When he would cry his mouth would cover his whole tiny face. If at night Camryn woke up first, his tiny cry would then wake up Logan, who in turn would holler into the baby monitor to wake me up in a jolt. His mouth and his cry were his defining fetures. The doctor's office became our second home. Not only were we there for their routine check-ups, but also for the countless emergency trips for Logan. He was diagnosed with pneumonia at 2 months old. It took 2 courses of antibiotics to get that under control, just for him to get it again at 3 months old. We had to go in once a week to get Logan's blood oxygen checked and see if his Pulmicort ( a breathing medication) had to be increased. By Christmas, he was just about normal again. He was breathing easier and was starting to gain weight like a boy his age should. He was starting to catch up to Camryn in all the normal milestones. Logan was starting to smile at me and my mother, and roll around when he was put on the floor next to his brother. His colik was starting to go away and he was becoming more calming to be around. On January 8, 2005 all hell broke loose once again. I was working 2nd shift, so my mother was watching to boys until midnight at my house. I got a call at 11:30pm while I was still at work. She sounded frazzled and I could hear Logan SCREAMING in the backround at the top of his lungs. She was calling to tell me that she had had enough and to come straight home from work. When I got home at 12:15, my older sister, Karli, was sitting in the rocking chair with Logan sleeping in her arms. Camryn was passed out in his carseat. My mother was pacing when I asked her what Karli was doing there. She had called her because she couldn't handle it anymore. It was below 0 outside, so my mother went out to start her car to warm it up. She came back and realized that her car locks automatically and she had left her purse in the seat with her spare keys. My mother was irritated beyond all belief. She called a tow truck to come unlock her car. While we were waiting for them, Logan woke back up and my mother took him to try to console him before she left. He smiled at her, which warmed her heart. She got him back to sleep just as the tow truck got to my house. What none of us knew at the time, was that was the last time my mother was to ever see Logan smile. My mother locking her keys in her car, was a blessing in disguise. Sunday January 9, 2005 Logan started to get sick again. He was running a fever and getting diareha . His breathing was becoming labored once again. I got him into the doctor's office and they upped his Albuterol to 4 times a day. Monday came and he seemed to be OK. His fever had gone down to almost normal levels, so I brought both of the boys to daycare and headed to work. At 5pm, I got a frantic call from Sandy (a family friend, who is also the daycare provider for me and my older sister's 4 kids). She told me that Logan's fever had come back and was over 103 degrees. I got a replacement for the register and left to bring him up to the hospital. I left Camryn with Sandy and headed in to Burlington. When I got to the hospital, the nurses checked his vitals and told me that the doctor would be in shortly. An hour later, a doctor came in. I don't remember his name, but I will never forget the way that he treated me that night. I still blame Logan's death on him, even though research has proven that he was not directly at fault. First of all, the doctor kept on calling Logan a "she" despite me continuously correcting him. He asked me a few questions about Logan's medical history, how many diapers he had wet in the last 2 days, and if he was on any medications for his breathing. I had told him that he was on Albuterol and Pulmicort. The doctor then had me give him a treatment there and a dose of Prelone (a steroid that many people have told me NEVER to give a child) and sent me home. The whole trip turned out to be 5 and 1/2 hours long. I left the hospital mad as hell and picked up Camryn at Sandy's. Tuesday was my day off from work, so I planned to keep Logan home to not irritate his little lungs any further. He looked 100% better. I knew that he was still sick, but he was pink again and laughing and smiling at me being silly. When I put him on the floor, he would roll around and grab for toys. I would have never thought that he had less than 24 hours to be the little boy that he was growing up to be. WEDNESDAY January 12, 2005. This was the day that I will NEVER forget until the day that I die. Logan was coughing the night before, so I had him sleep with me in my room. Him and Camryn shared a crib and I didn't want him to get his brother sick. At 7am, Logan let out a very feeble cry, which is not normal for him. I got up, got dressed, and brought Logan over to my bed to play with him for a little while before Camryn woke up. Logan was acting fine, smiling and laughing at me. I didn't have to go to work until 4pm, so I figured that when Camryn woke up I would go visit my friend Missy who hadn't seen the kids in a few weeks. At Missy's I had the kids in their carseats in the living room. They were both sleeping and Missy's 4 year old daughter, Alex, was watching TV. A little after noon, Logan let out the same tiny cry, which scared me, so I went over to him and picked him up. He was burning up! I put him in a lukewarm bath, changed his clothes, and gave him some Motrin. I had gone through the same thing so many times before that I knew the drill. I was waiting for the doctor's office to open up after lunch, so I could make an appointment. In the meantime, I made Logan a bottle and put him down for a nap in his carseat. I checked him a few times, and his fever was starting to break somewhat. I left him in his seat in the living room and went back into the kitchen to drink my coffee. I looked into the living room and saw Alex putting a blanket on Logan and told her "NO". I didn't want her to smother him. I went in to go check on him and got the shock of my life. When I was face to face with him I saw his eyes were wide open and his lips were blue. I screamed to call 911. I tried to do CPR on him, but I was crying hysterically. The operator was giving me instructions, but I had to pass her over to Missy. The police showed up within 1 minute. They took Logan and began to do CPR on him. When the EMT's arrived, one of them, Mora, brough me into the kitchen to try and keep me out of everyones way. She started to ask me questions. The doctors at the hospital tried everything at least 3 times, but nothing would keep his heart pumping. They wouldn't have been able to do life support, because his heart would only beat with constant doses of adrenaline. One of the nurses came and got me from the "Family Room" to have me give the order to stop all lifesaving measures. I brought my mother and my sister with me for support. When I reached the room, all these hands were pushing and pounding on my fragile boy's chest and I cried out " STOP!" I threw my hands up and fell to the floor in tears. My mother fell to the floor with me and held me. Karli clung to the door frame. The nurses asked me if I wanted her to go get the rest of the family so they could come and say good-bye. I was allowed to hold Logan for 2 hours before they told me that he had to go. I did give him up to the others that came in to say good-bye, including his father's sister, Chrystal, and his other grandmother, Nancy. My father flew up from Florida to attend Logan's funeral. He even helped me with all of the arrangements. I decided to have him cremated, but got called selfish from the other half of the family. I, surprisingly, stuck to my guns despite the fact that I even got harrased at the service. My father kept telling me not to give in to people that were never even interested in his life in the first place until it was conveinient for them. Despite the debate over whether to bury or cremate, the service was beautiful. Over 100 people came to show their support and respect. In his obituary, my sister Karli wanted me to let everybody know that he was "Our Little E.T." She had named him that when he was 1 minute old. She was in the room when I had my C-Section, and that was the first thing that came to mind when she saw him. The name suited him, and I was proud to announce it to the world. All in all, I was blessed. Not many people can say they were threre when their child was born AND when they died. I can. I wish I never had to go through this whole experience, but I am proud to say that I was with him every day of his life. 128 days to be exact. 4 months, 5 days, and 12 minutes that were not lived in vain. 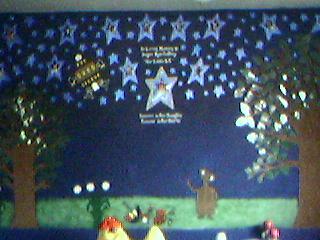 This wall was made at his daycare by Sandy. This is the first picture of Camryn and Logan together. They were only 5 minutes old. Logan is the smaller of the 2. 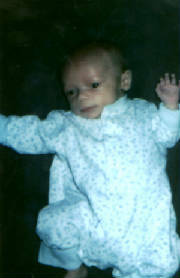 He was 4 pounds 12 and 1/2 ounces and 18 inches long. Camryn was 6 pounds 4 ounces and 20 inches long. After Logan passed, I came to the conclusion that the light on Logan's diaper was God's way of telling me that he was here for a short period and to make the most of his time.